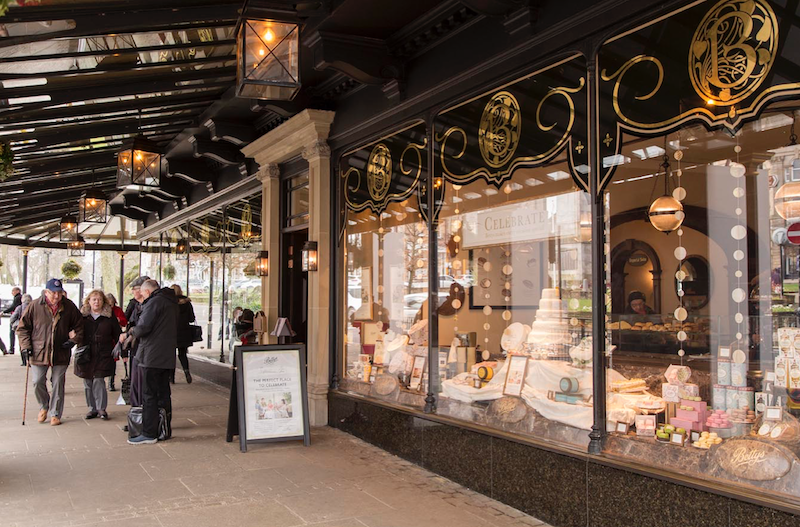 When it comes to traditional cafe tea rooms, there is no more cherished place than Bettys – a 98-year-old institution serving patisserie, confectionery, hand-baked goods, teas and coffees in its six cafes and shops across the county. 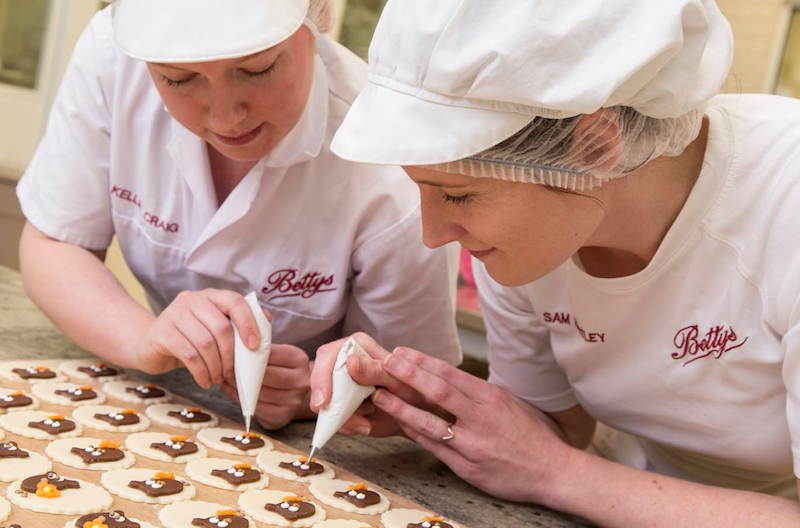 With 1,000 staff and 2.4 million customers a year from the UK as well as Japan, China and New Zealand, Bettys remains a family-owned business run on the principle that traditional ways are best, that a beautiful setting is good for the soul and that life can be improved with a few simple pleasures. Those pleasures might include a warm buttered scone or a lavish afternoon cream tea; perhaps a steaming dish of Yorkshire Rarebit or a full English breakfast. What is guaranteed is the sort of attention to detail that gets lost in many contemporary chains: obliging waitresses in smart black-and-white uniforms, tea served in silver teapots inside historic buildings, and what the company identifies as ‘a warm Yorkshire welcome with Swiss finesse’ in a nod to Swiss confectioner Frederick Belmont, who opened the first Bettys in Harrogate in 1919. The beating heart of this venerable empire is the craft bakery in Harrogate, where 166 people work from 1am to 3pm every day, producing the goods which leave on vans at 7.30am every morning for delivery to the cafes and shops. Work starts in the bakery at 1am when the ovens are switched on. Next, the bread team check the computer-monitored provers and start loading the ovens. 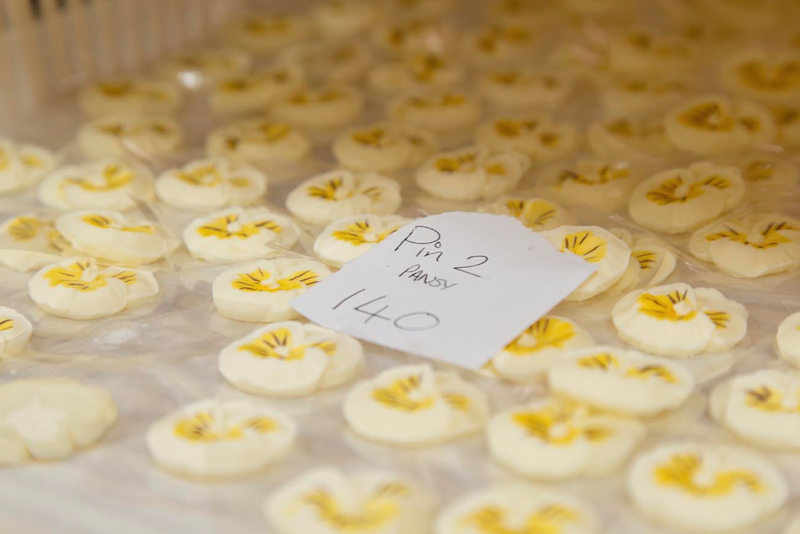 At 2am, the despatch team arrive and start preparations for packing as the confectionery team finishes the fresh cream cakes and fresh fruit tartlets. 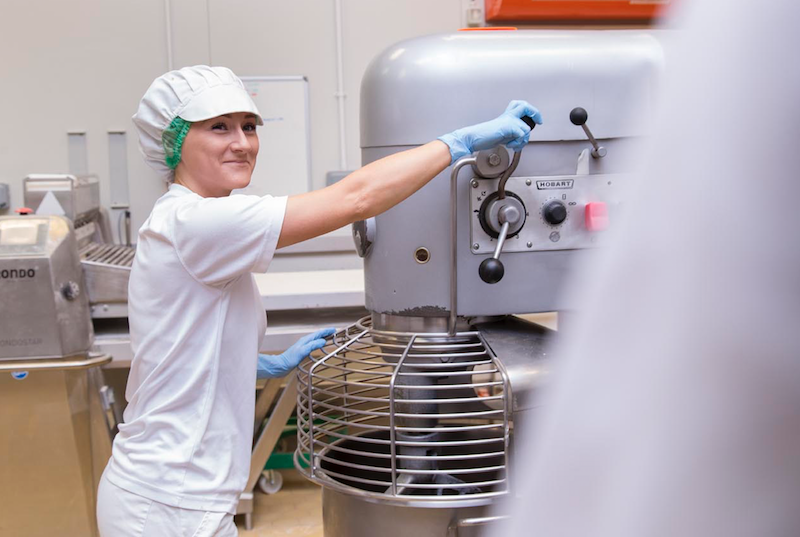 At 3am the bread team start preparing for the next day, and at 4am the pastry team start making the signature Fat Rascals – huge fruit scones decorated with a cheeky almond and cherry face… At 5am a chocolatier turns on the tempering machines and starts work. The rest of the team arrive at 6am or 10am. The workers in the busy Confectionery Room wear two caps over their hair, flat shoes and no jewellery other than wedding rings (not even engagement rings). 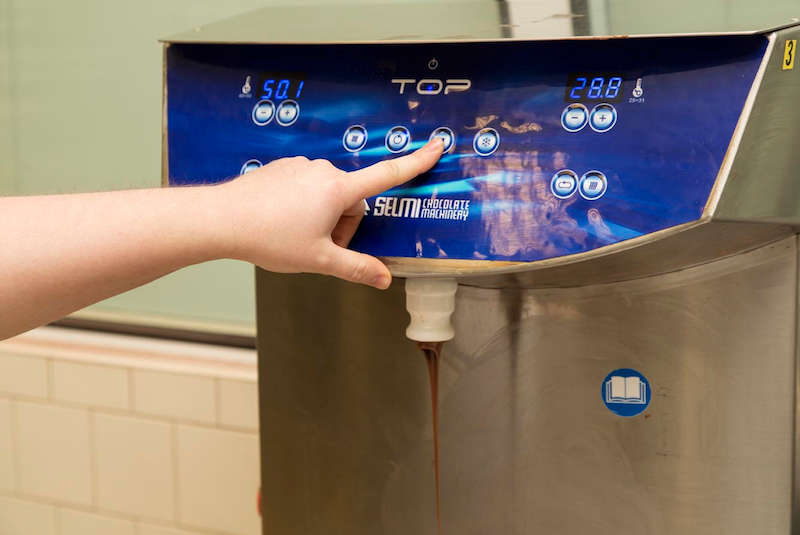 Staff wear gloves when handling meat, but the company prefers a strict hand-washing policy as it’s more effective than wearing gloves, they say, and easier for bakers to mould or decorate as dough and cake batter can often spill into gloves. Here they are bagging and bowing tiny Easter eggs. Elsewhere staff are decorating vanilla slices, chocolate financiers (chocolate sponge iced with chocolate buttercream), fruit flans, dainty multi-coloured macaroons and pistachio cream éclairs. 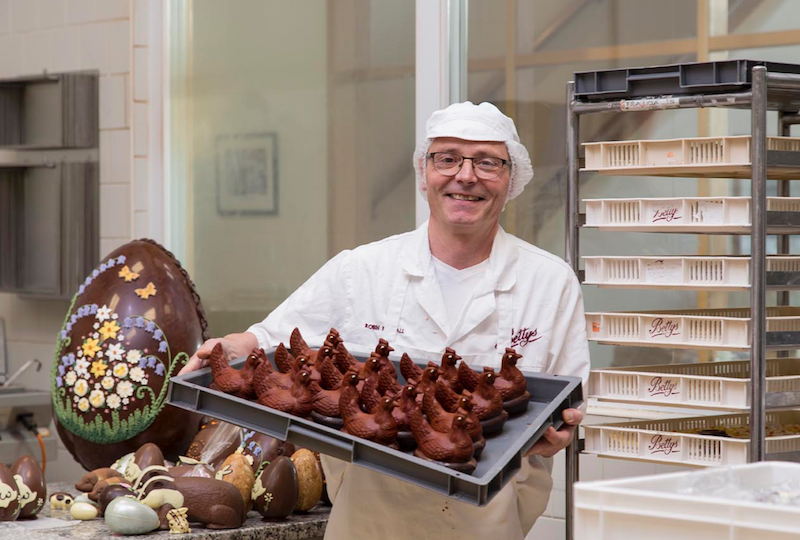 Bettys gets through about 5,000kg of flour a week from a local mill, 900kg of chocolate from Felchlin Switzerland and 33,000 local eggs, all delivered in bulk to the bakery by van. 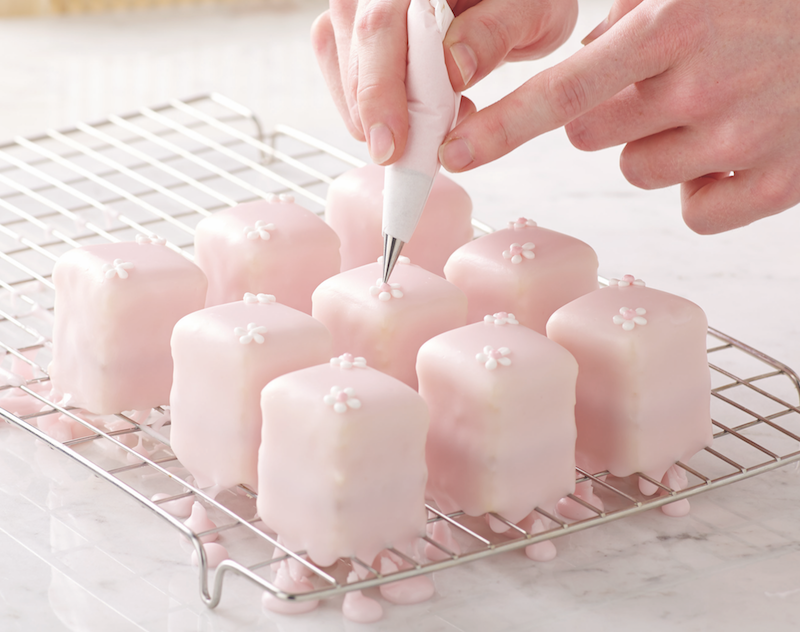 The signature hand-piped Fondant Fancies are produced in stages. Made from Genoese sponge cake, each one is sandwiched with buttercream and raspberry preserve then covered with marzipan, a shiny coat of pink or ivory fondant icing and then individually decorated with sugar flowers. 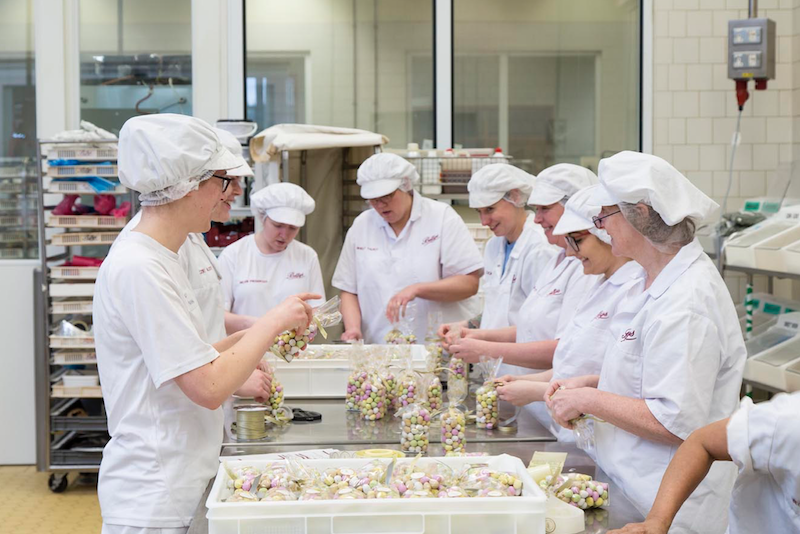 Confectionery team leader Sam Hartley, jokes about ‘the Bettys half stone’– many new recruits put on weight at first as they sample so many goodies in the course of a day’s work. 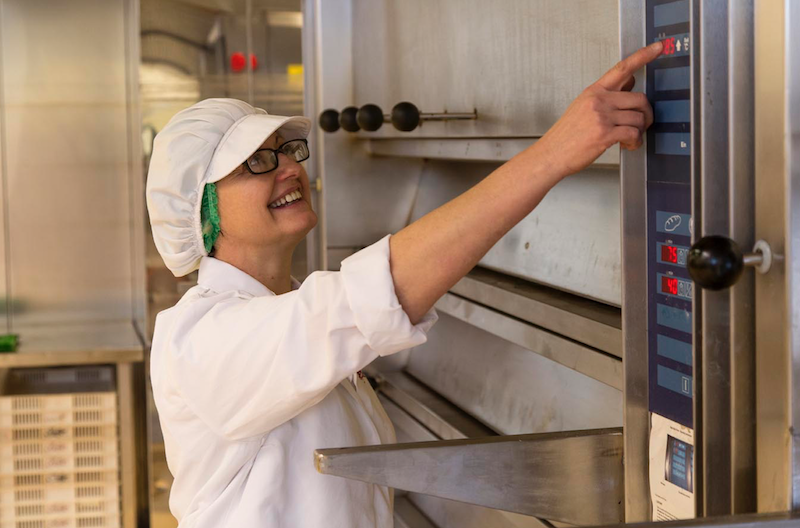 There are 166 people working in the purpose-built Craft Bakery in Harrogate, which opened in opened in 2000 and produces more than 200 Yorkshire and continental specialities and typically creates 5.4 million products for the Bettys cafe tea rooms and online business. 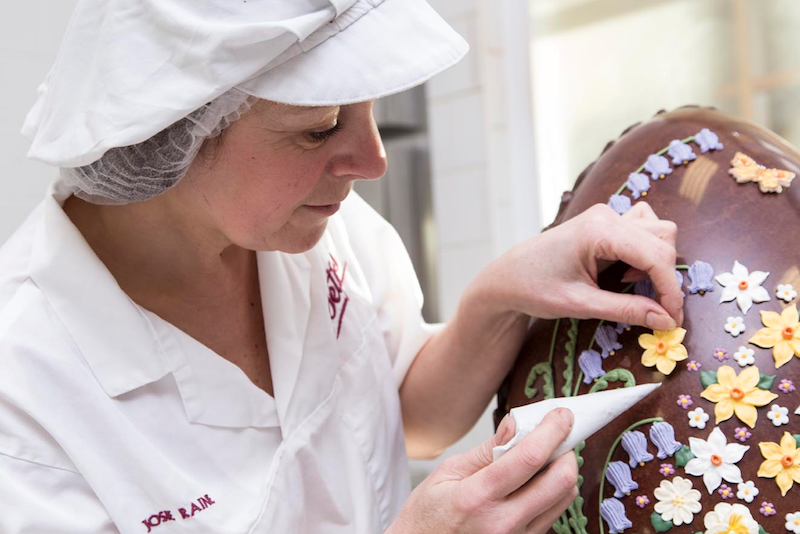 Josie Raine, who has worked at Bettys for 37 years, is working on the giant made-to-order Imperial Egg, weighing 12lb and hand-decorated with spring flowers. 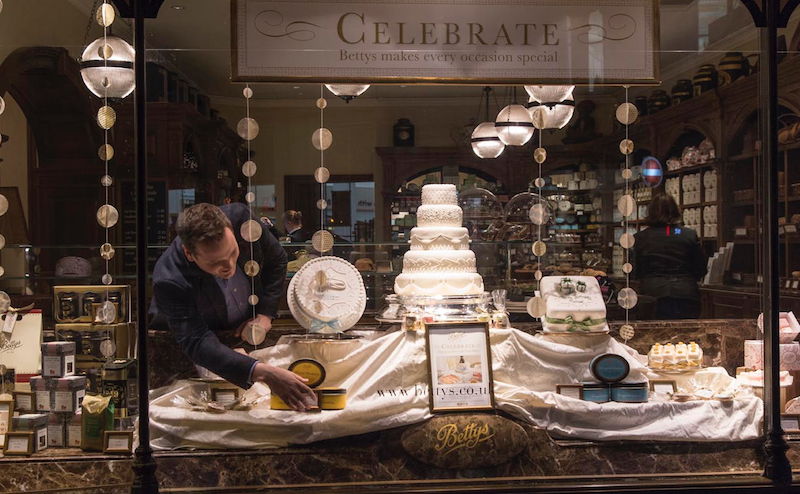 Taking two whole days to make, the price tag is a hefty £250 but Bettys still sold 17 of these last year – one specially commissioned by a bride-to-be instead of a wedding cake. 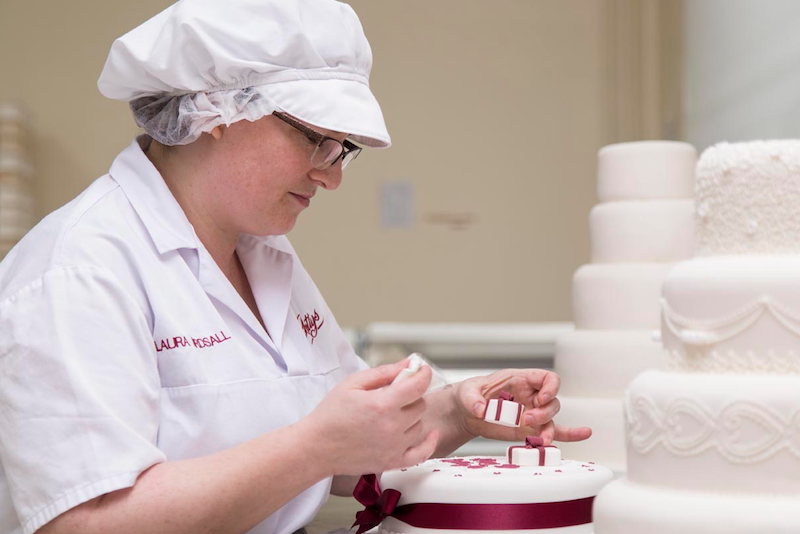 Cake decorator Laura Birdsall, who’s been with Bettys for eight years, puts the finishing touches to a 90th birthday cake. 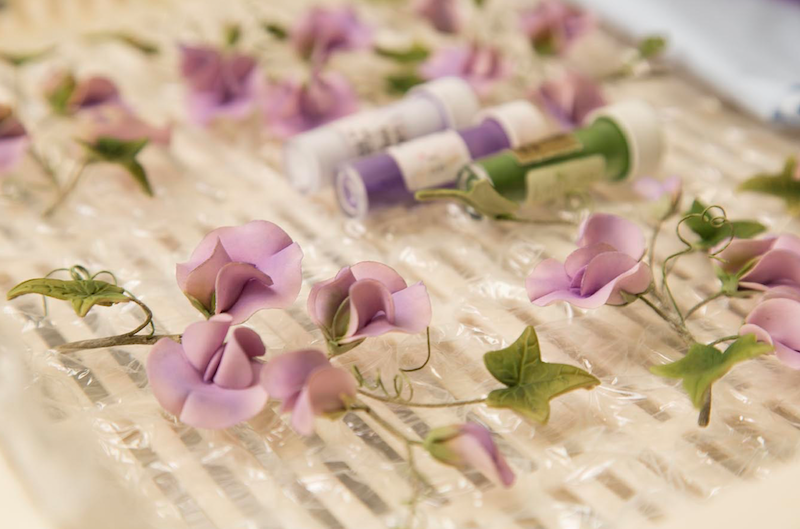 “It’s intricate work and I love the fine detail, especially on traditional Royal icing wedding cakes,” she says. 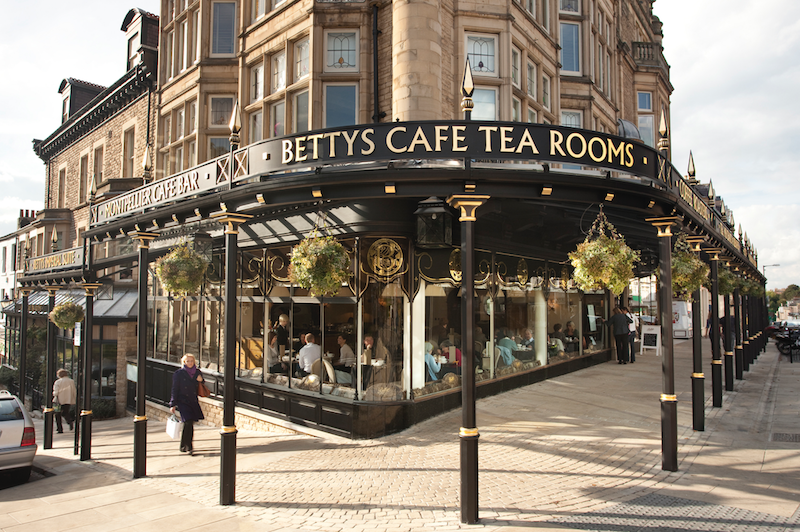 Queues often form as Bettys doesn’t take bookings other than for its specialist Lady Betty Afternoon Tea, but queuing is all part of the fun, according to Harrogate cafe tea room front-of-house manager Sam Barber. She says, “You can’t book a table in the tea rooms, so celebrities have to queue along with everyone else.” There are exceptions though: when The Prince of Wales asked if he could pop in for tea, his security staff put their foot down and said the prince couldn’t possibly queue. 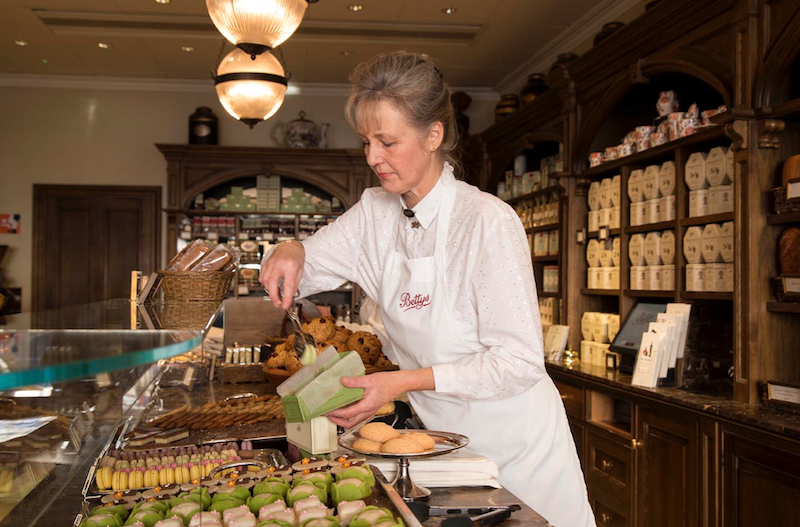 Bettys employs as many as 170 staff per tea room. The dishwashing team washes more than 7,000 dishes on a busy Saturday in the Harrogate cafe tea rooms alone. 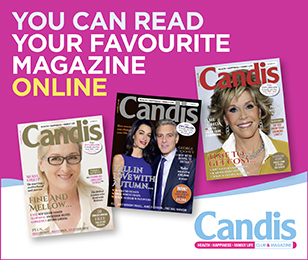 Robyn Cox – known unofficially as the ‘head of beautiful’ – is the company’s visual merchandising manager. 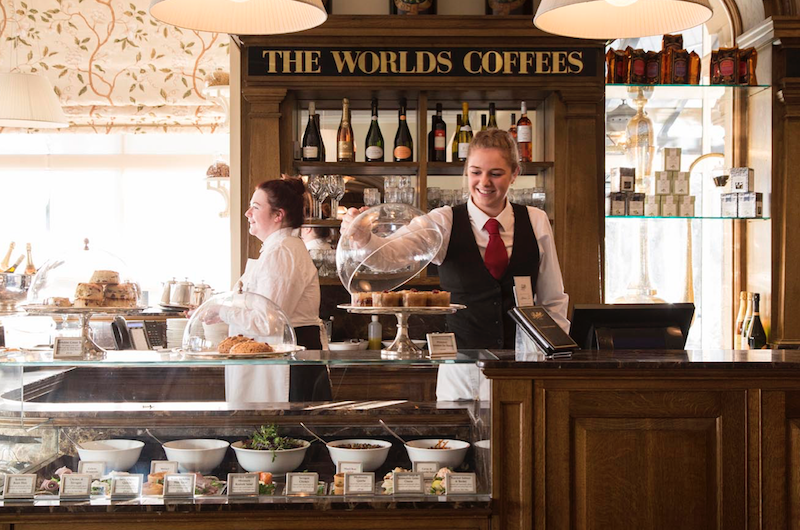 The shops – there are six of them, one at each cafe tea room – are as handsome as they are popular: teas, coffees, cakes, pastries, breads, biscuits, chocolates and countless other treats all served up in beautiful surroundings. 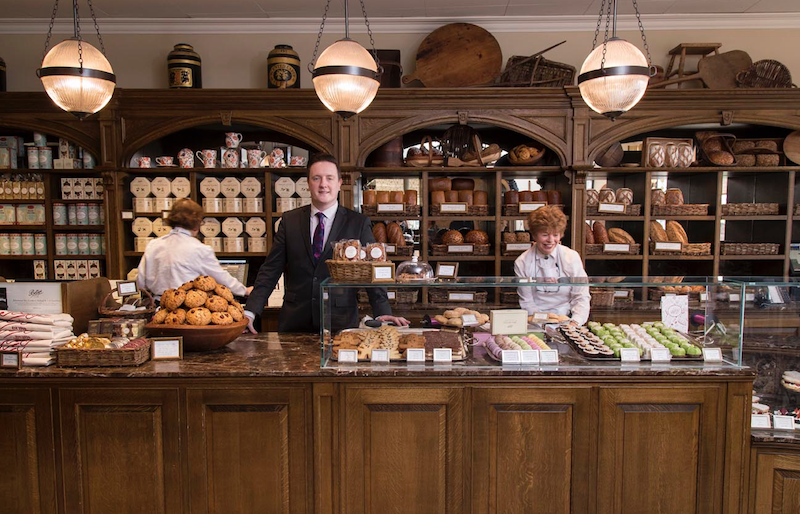 Some 900,000 people shop at Bettys every year, while 90,000 people buy goods online. Bettys sells nearly 8,000 Fat Rascals every week (they’re piled on the counter here). 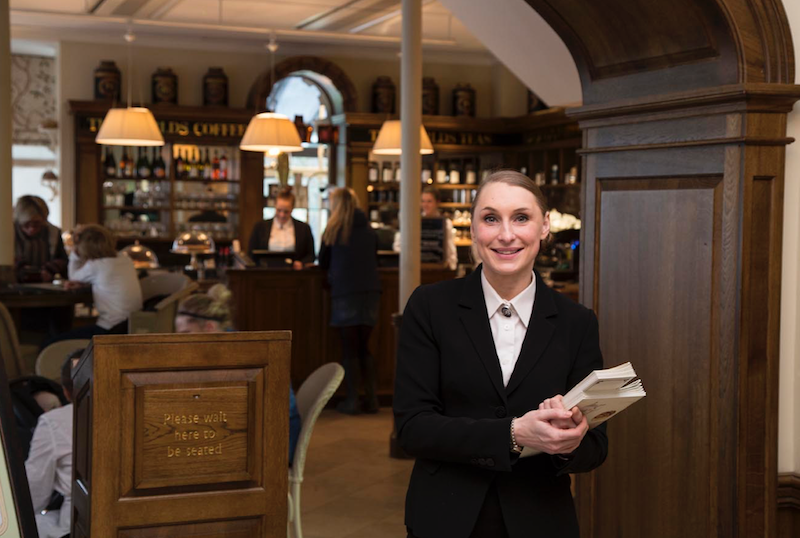 Ex-flight attendant Karen Merrin, 51, has worked in the shop at Bettys Harrogate for 16 years and cuts a dash in her uniform – a traditional white broderie anglaise blouse and black A-line wool skirt. “Customers come here expecting a very high standard of service because of our reputation and it’s my job to make sure they go away happy,” she says. 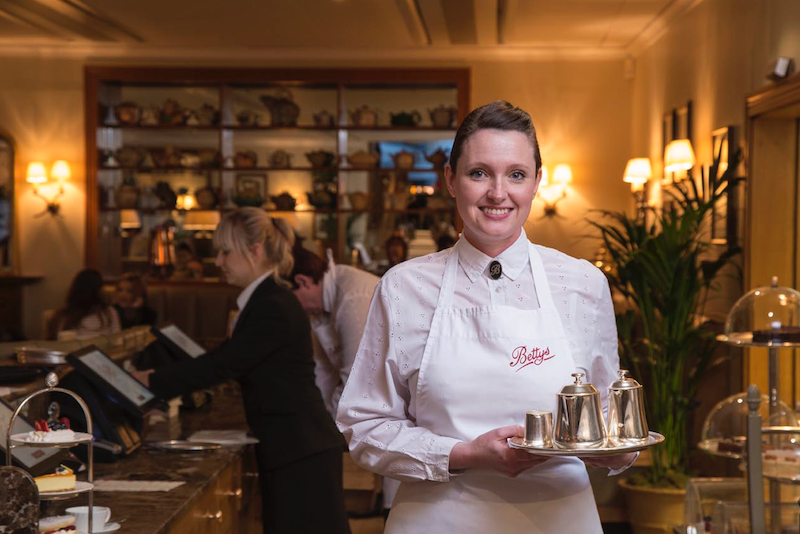 Waitress Jo Smith, 37, has worked for Bettys in Harrogate since she was 16. Jo says she put on the ‘Bettys half stone’ when she started work here and admits it wasn’t all plain sailing as she learnt her craft. “There was a small patch of chutney on the restaurant ceiling for a while after I crashed into someone and threw the contents of my tray into the air!” More than two decades later, Jo says the service at Bettys is all about a warm smile, an ability to read what will make a customer happy – and stoicism when her feet are sore at the end of a long shift. Have always dreamed of going to Betty’s tea room. Have heard great reports.